Locations: Ansel Adams & Yosemite Wildernesses, including Donahue Pass (11,056 ft.), Mount Lyell (13,120 ft.), Simmons Peak (12,497 ft.), Kuna Crest South (11,812 ft.), Koip Peak (12,968 ft.) and Mount Wood (12,657 ft.). Synopsis: Towards the end of April each year, Jon and I start pouring over topo maps to piece together potential multi-day tours into the High Sierra. It is one of my favorite activities of the year, as there is so much potential for exploration deeper into the range. This year, the High Sierra had a pretty weak winter, so snowpack depth was of paramount concern. Colin was nice enough to link us to some NOAA snow coverage and SWE models that over layed on maps. Using this enabled us to quickly scrap some ideas we had been thinking about in the more Southern Sierra, as the snow coverage looked really thin. Synopsis: While the lack of snow in the Sierra has delayed the start of ski season, it has also offered a historical statistic of sorts – namely, Tioga Pass is currently open in January. According to data compiled by the Mono Lake Committee, since 1933 Tioga Pass has only been open six times post-December, with the former record being January 1 in 2000. Being an optimist of sorts, I was excited as this offers easy access to the High Sierra for one approaching from the West side of the range. 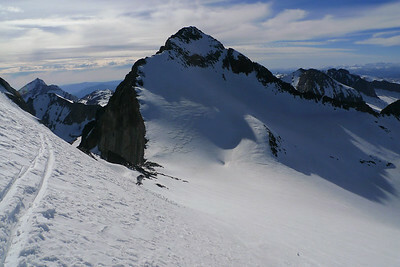 Brandon and I had our eyes set on the classic alpine climb of the North Couloir of North Peak (12,242 ft). With the lack of snow and constant cold temps at that elevation, we were hoping that the North Couloir would possibly continue to hold ice conditions – although we were actually expecting hard neve. In either case, the chance to climb the North Couloir in January with a mostly snowless approach in winter weather conditions (think (i) cold and (ii) very windy) sounded too good to be true. 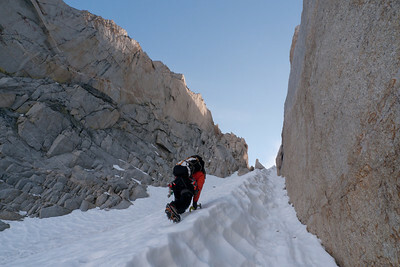 Synopsis: After a successful trip on the Northeast Couloir of Mount Gilbert the day prior, Jon and I headed on yet another early alpine start for some ultra-classic climbing on Matthes Crest. Matthes Crest is one of the most unique climbs I have ever done. Approaching from the Cathedral Lakes trailhead, Matthes Crest is a very unique granite knife-ridge that was glacially formed. Although it is only about 500 vertical feet from the ground, the knife-ridge itself runs for over a mile long. Similar to most parties, we climbed to the North Tower and rapped from the dedicated rap rings. Ultimately, it rightly deserves its recognition for its classic status, offering awesome climbing, great exposure and unbelievable views. Synopsis: Brandon and I headed up to Tuolumne Meadows for a great weekend of climbing on some classic multi-pitch dome routes: (i) Great White Book on Stately Pleasure Dome, (ii) Holdless Horror on Dozier Dome, (iii) Zee Tree on Pywiack Dome and (iv) Errett Out on Dozier Dome. The weather was great and the scenery spectacular. I also got to try out my new camera for shots from the ground (as I would never climb with this thing): a Canon 60D with a Canon 15-85mm F/3.5-5.6 IS USM lens. All climbing shots (and shots from the summits) are with my much smaller Panasonic LX-3. On the drive in Saturday morning, the skies were very overcast and there was some very sporadic rain (in quantity, location and time-lapse). We got a little worried, as rain + granite slab = no fun. However, the rain didn’t seem to impact the Tuolumne area (other than about 2 minutes of very light rain over Tenaya Lake) and the skies eventually cleared up during the day. 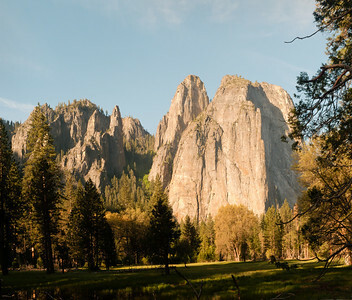 Synopsis: Sarah and I headed for a quick weekend trip to Yosemite Valley to check out the large waterfalls given the huge winter snowpack this year. I have never been to Yosemite Valley to see the spring run-off. More importantly, I was very excited for the trip as this was Sarah’s first time in Yosemite. Although it was too short, Sarah really enjoyed walking around the Valley and I am sure it is the first of many trips.